Posted on November 21, 2017 at 9:06 am. Online casino software developer, Net Entertainment, has optimised its live blackjack title for smartphones and tablets. 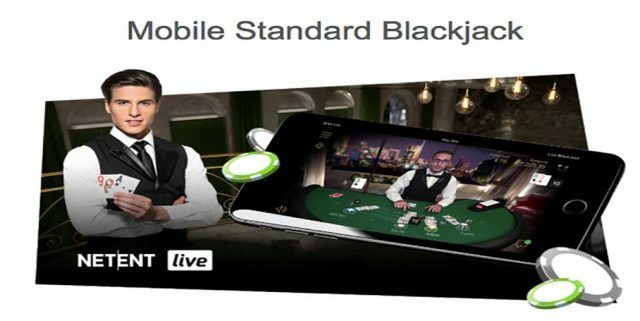 You can now transform your commute home or coffee shop stop into a real money blackjack experience thanks to NetEnt’s Live Mobile Standard Blackjack game. The online casino software developer has redesigned the desktop game to offer a premium gaming experience on portable devices, and it is only a few taps away. You can head to any NetEnt online casino on your Apple, Android or other smartphone or tablet – we recommend Rizk or Guts online casinos – and play the live title. While you will need an account to play the live croupier game, you can sign up on your mobile device too. Once you’ve logged in, you can open up the live dealer blackjack game and a professional croupier will appear. He or she is streamed in real time from one of NetEnt’s live studios so you can carry a casino dealer with you wherever you go. The game offers a range of side bets, and you can tap your screen to place a wager, with ‘no more bets’ clearly indicated on your screen and announced by the dealer. There is a range of table limits available to choose from to suit every bankroll. You can also mute the sound if you don’t have earphones and tap around the innovative user interface to enable and disable other features, while the statistics and the history of the dealer’s last 10 hands are clearly visible. Try out the Live Mobile Standard Blackjack title at our recommended NetEnt online casinos, where you can also claim generous bonuses with fair wagering requirements. NetEnt also offers a range of other online casino games for smartphones and tablets, including live roulette, and standard random number generator games, which are all available at Rizk online casino. Watch the video below to see a sneak preview of what you can expect when playing NetEnt’s live blackjack game for mobile devices.